What do golden rafts of seaweed, great ocean currents, and ghost stories have in common? They all play a part in the history and ecology of the Sargasso Sea, the focus of the 2012 Explorer program at BIOS that introduced 1300 primary students to hands-on marine biology, chemistry, and physics. With the recent publication of an “Expedition Sargasso” lesson plan by Kaitlin Baird, Assistant Director of Science Education Programs at BIOS, many more students will be able to discover the unique communities that thrive in Sargassum seaweed and explore the interconnectedness of ocean ecosystems. 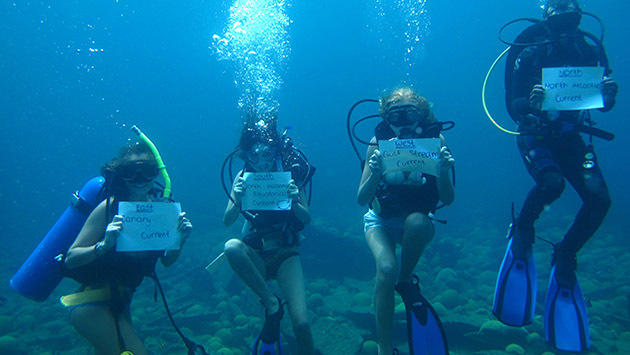 The lesson plan appeared in the December 2014 issue of the peer-reviewed Journal of Marine Education, published by the National Marine Educators Association (NMEA). The journal reaches an international audience of educators dedicated to improving ocean literacy, and Baird’s lesson was published with seven other articles describing innovative educational initiatives from marine science educators across the United States. Baird’s lesson challenges students to make connections between predators and prey, and to reflect on the food web that sustains life in the Sargasso Sea and beyond. The Sargasso Sea is unique in that it is the only sea in the world without land borders; rather, it is bordered by ocean currents that flow clockwise around the North Atlantic, and named for the Sargassum seaweed that accumulates in the region. Unlike other seaweeds that must attach to hard surfaces, some species of Sargassum spend their entire lifecycle afloat and provide vital habitat and sustenance for a wide range of creatures. 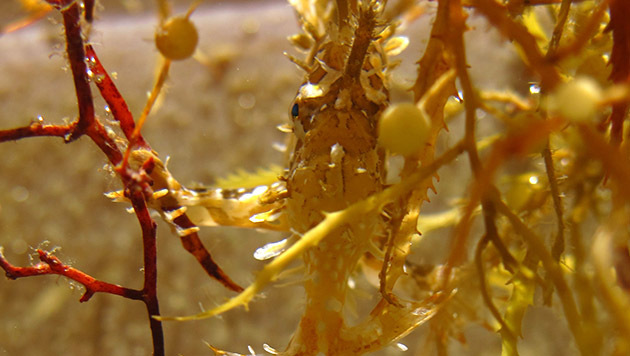 Dozens of unique invertebrates and fish thrive within the Sargassum, and many are exquisitely camouflaged with weedy appendages and golden-brown colors. Likewise, many of the ocean’s most charismatic animals (like baby sea turtles and juvenile sport fish) also seek refuge in Sargassum at critical points in their lifecycle. This year, Baird and Ocean Academy Director JP Skinner have launched MARINE, the newest HSBC Explorer program that helps students learn physics, tinker with technology, and develop their teamwork and leadership skills through a Remotely Operated Vehicle (ROV) design and piloting competition. You will find the next generation of Sargasso Sea explorers at the underwater robotics competition on March 7th, 2015, at the National Sports Center.